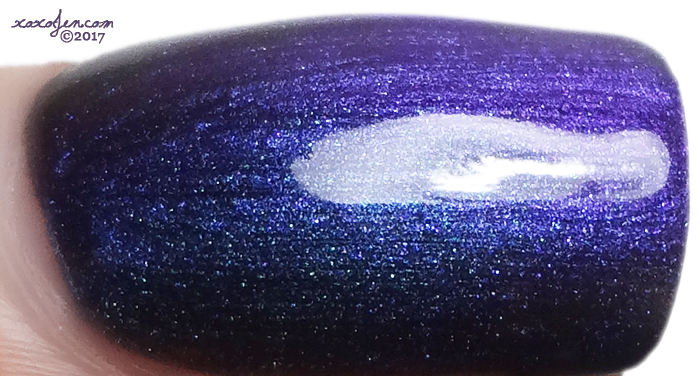 I'm gonna cheat, and use KBShimmer's descriptions and intro for this post. 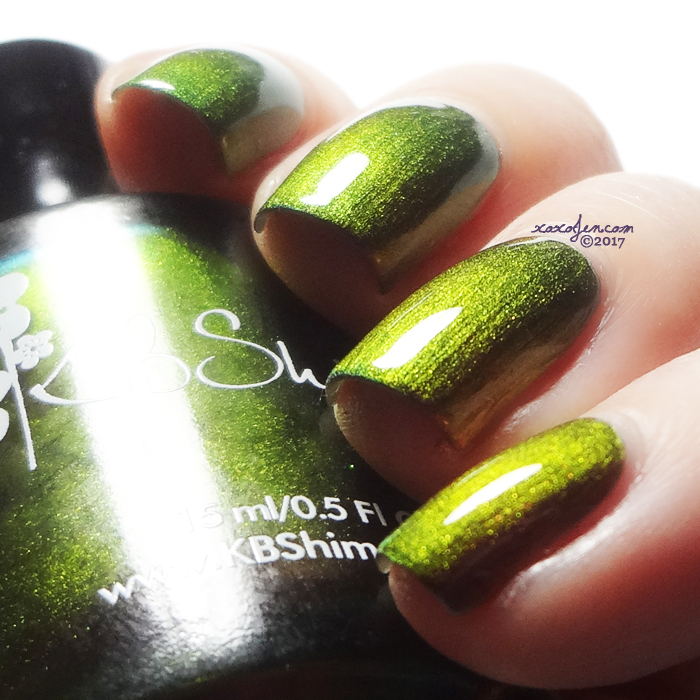 It's crunch time for Polish Con, and I wanted to get this published asap for you all to see more swatches. 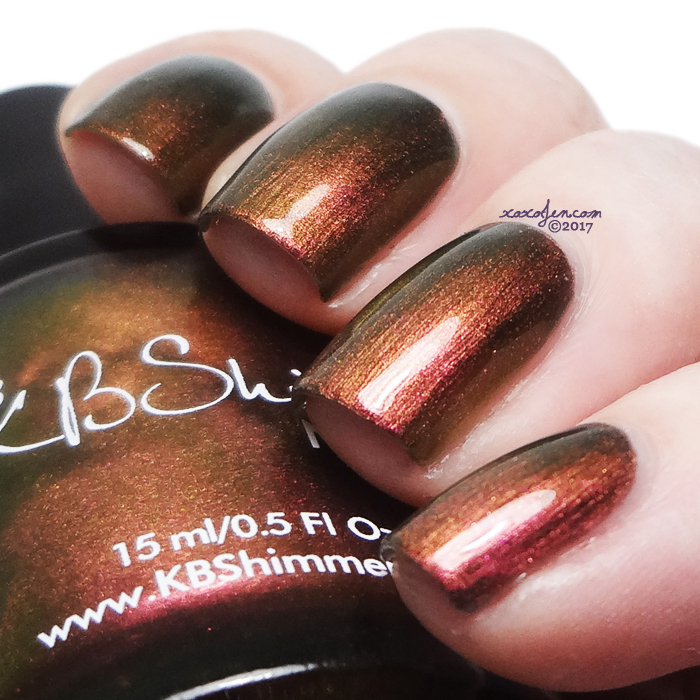 KBShimmer Launches 6 New Multi Chrome Polishes at Polish Con April 29th and Online May 5th. Multi-Chrome polishes are some of the most distracting nail polishes ever. Changing, shifting, morphing colors all based on the angle of your tips. 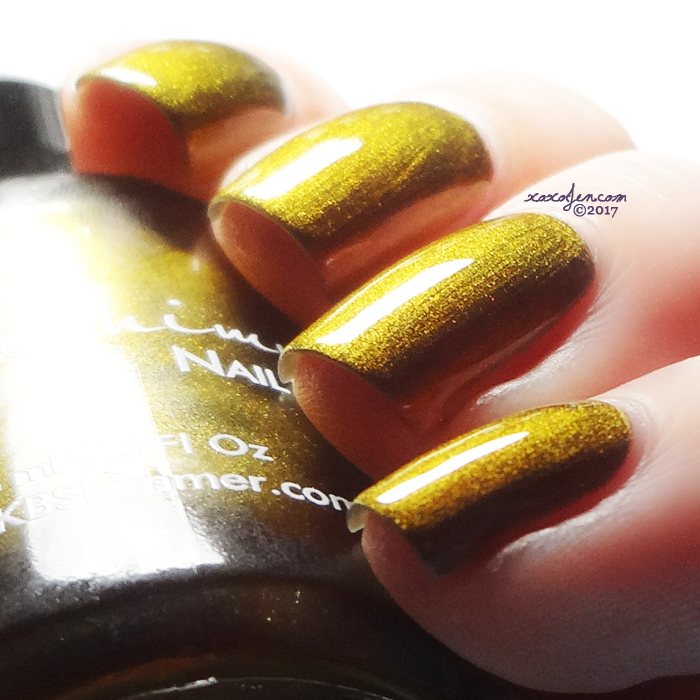 These polishes are jaw-dropping, just by changing the angle you view your nails at, you can see an instant flip of your polish color, no sun or temperature change needed! Just move your fingers and toes and watch the magic as these polish shades dazzle you with their magical color shifting powers. 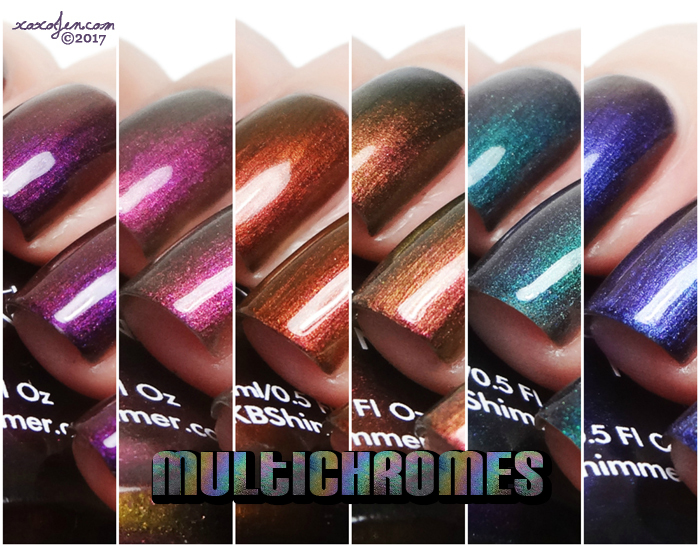 Joining fan favorites Shade Shifter and Pigment Of My Imagination are 6 all new multi chrome shades. Flip Flop Hooray –This shifty shade starts with a rich emerald green, which morphs into shades of teal and navy, finally flipping to a warm grape purple with hints of magenta and red. Flip Flop Hooray is truly spectacular, with its complex shifts based on viewing angles. Iridescent Exposure – Iridescent Exposure is a complex color shifting shade that starts with a dusty teal color. From the dusty teal, we see shades of cyan and blue, cool purples and rich magenta reds. 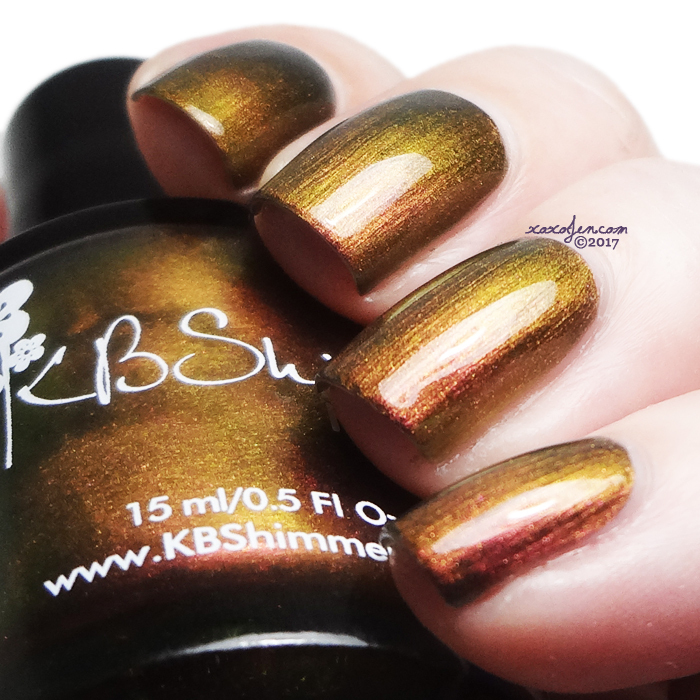 This jewel toned shade is not to be missed! Chroma Chameleon – Chroma Chameleon is a vibrant shifting shade that morphs from a bright fuchsia pink, to a coppery rose, then a soft gold, to a spring green color when you change viewing angles. 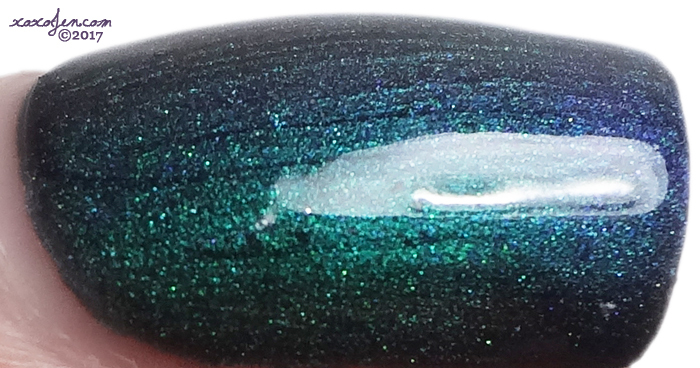 This polish will leave even the most talented chameleon jealous! Wine Not? – More complex than the finest wine, at first look you see a warm burgundy shade, then you notice as angles change, that shades of purple, gold and bronze appear. Wine Not? is a shade that is absolutely not bordeaux-ing! Puns And Roses – Puns And Roses is a soft shade that starts by showing off a rosy pink color. As your viewing angle shifts, warm yellow gold and green hues pop through, with a hint of deeper green at the edges. 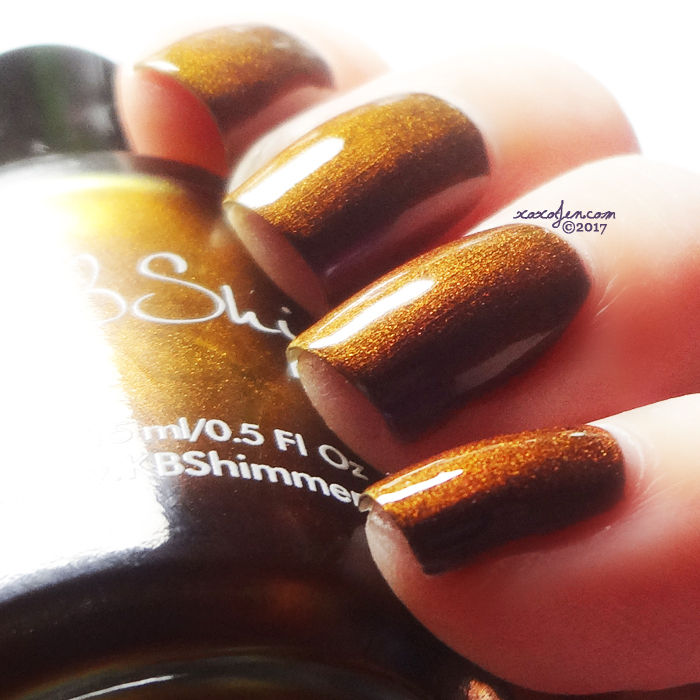 It’s A Blazing – It’s A Blazing is warm toned polish with an awe inspiring color shift reminiscent of fall. 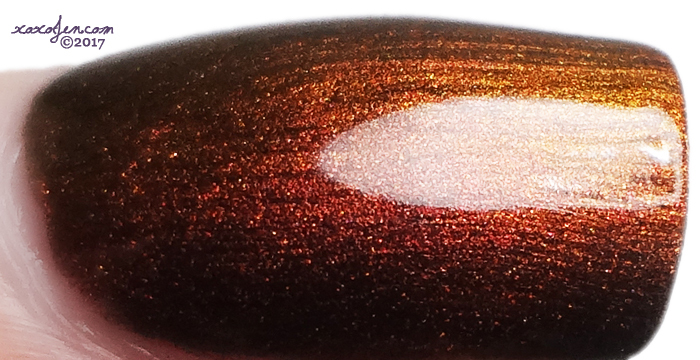 It starts with a warm, rich burgundy red color, then as your fingers move, a rich bronze shade pops out. At extreme angles, golden yellows and orange colors appear. This nail polish has more colors then a forest in autumn! A quick blurb about these from me - each of these polishes has a smooth easy to apply formula, most were opaque in two coats. For a few, I added a third coat to ensure no vnl under bright photo lighting. I'm also going to let you in on a little secret of mine that camouflages brush strokes pretty well, should you have any. 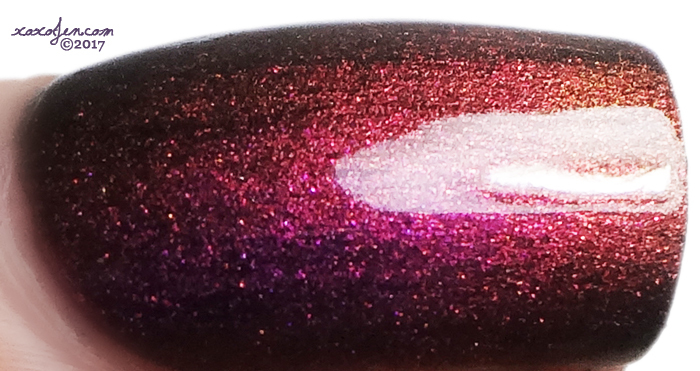 Pick up the KBShimmer 'Oh Matte!' 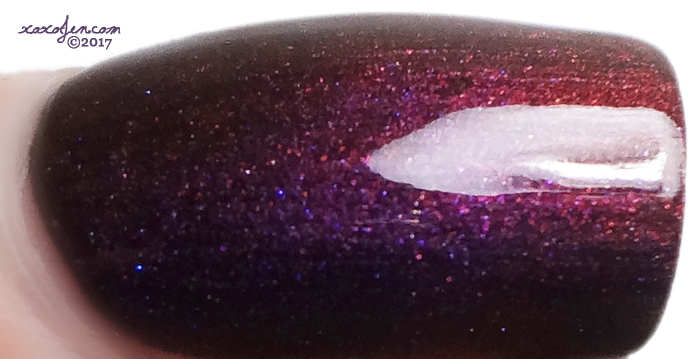 topcoat, top your multichromes with it, and then top with KBShimmer's 'Clearly On Top' topcoat. It's like magic, guys! If you're going to con, say hi to me! I'll be wearing a blue shirt with pink holo Polish Con logo on the front and Director on the back. Thank you for the comment! I enjoyed swatching and shooting them, such morphers! Some great swatches of them. They look pretty awesome.